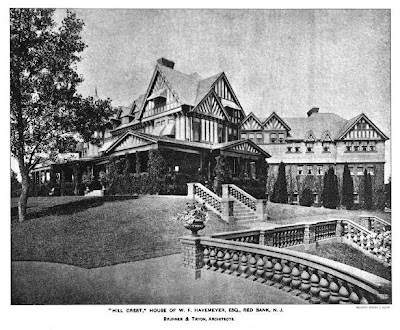 'Hill Crest', the William F. Havemeyer estate designed by Brunner & Tryon c. 1897 in Red Bank, New Jersey, with landscaping by Nathan Franklin Barrett. Havemeyer, vice-president of the National Bank of North America, was a son of former Mayor of New York City William F. Havemeyer. The house has since been demolished. Click HERE to see a 1931 aerial of what I believe to be the area where 'Hill Crest' stood. 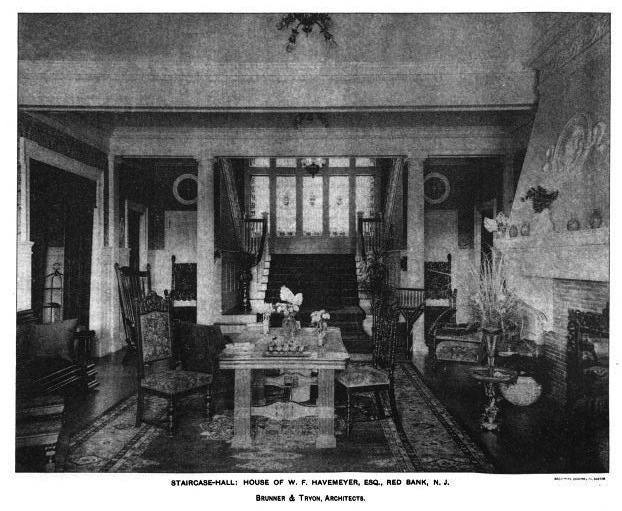 Photos from American Architect & Architecture, 1898. This is a shame.....what a loss. Is this the same Havemeyer family that lived in Islip,(or was it Babylon.)? This site is a few blocks from my home, but is not the site shown in the old map. The map shows Rumson, NJ, but the Havemeyer estate was at the top of what is now named Hilltop Terrace in Red Bank, NJ. Sections of the balustrade remain. I have several copies of Brunner and Tryon's architects' plans and garden renderings that were published in American Architect and Building News that was published in November 1897. They are just photos of the colored prints. I'm happy to send them if you would like to incorporate them into your section on this estate. They continue to tear down these incredible structures in our area, it is heartbreaking. I'm so glad to "meet" others who appreciate them, too. I've read your blog postings about the South Shore of Long Island, where I grew up. Both are waterfront areas, an hour from Manhattan, so they had similar appeal for summer cottages, large and small. Just came across this post while looking for info on this estate and others in the Rumson/Middletown area. This estate was located not far from where I live. Susan is incorrect, your map is the correct areal for the site of this estate. Not that I think you'll ever see this post Susan, but if you do- this estate was located on the north side of rumson road near the intersection with Kemp Avenue. I think you mistake the location because many of the old estates are referred to as Red Bank in the original materials. Most of what I've seen on this estate refers to it as Rumson Road in Red Bank. The town names were far less specific back then and slimy referred to the nearest "town center" in a lot of cases. You should really look into the estates of Rumson and Middletown in NJ. I'd love if you could have some posts on them, it is very hard to find information on them if you don't know where to look (clearly you do lol) because so many of them were demolished in the 50's. In particular, I'd love to see if you could come up with any old pictures or information on the "rumson hill or rumsonhill" estate of the McCarter's. It was a huge 3 story Georgian type house. The present Sycamore Ave in Rumson was the driveway for that estate.